3.5 meters wide and 2.3 meters high fitted wardrobe. Designed to use 100% of available space, manufactured with the use of the best quality materials. And fitted with attention to the details for our customer from Pudsey, Leeds. The idea of the project was to combine modern and simple style with natural materials. 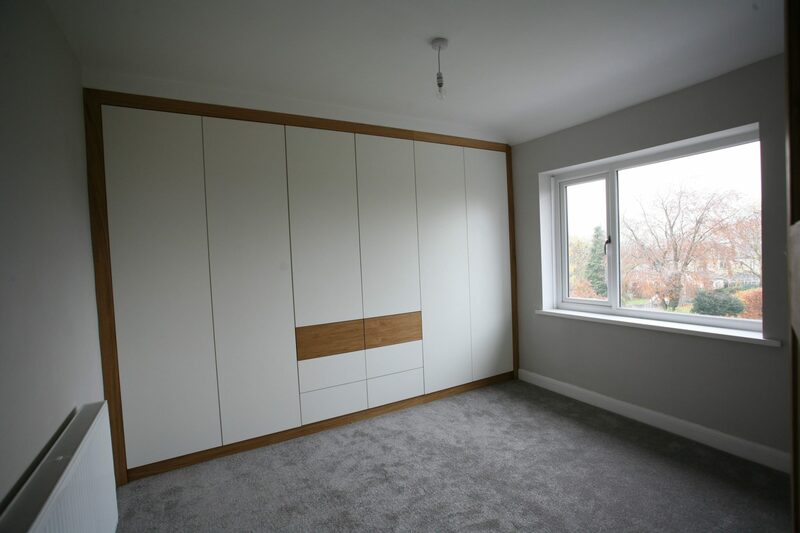 Giving the room plenty of storage space improve the functionality of the master bedroom. All internal structures made with high-quality 18 mm PVC edged Egger chipboard. Push to open doors made of the combination of white laminate and natural oak veneer. The cost of made to measure wardrobe in similar style starts from £2300 and depends from size, finish and internal configuration. At JS DECO we are happy to serve private and commercial customers. To find out the cost of your wardrobe contact us by email to get your quote after a short interview about your requirements or call us to arrange a visit to our studio/workshop where we will have a chance to look at available materials and possible solutions which we can implement in your bedroom. Newer PostHigh gloss and wood effect sliding wardrobes.